Giving Days – Campaigns that focus a groundswell of donations to a specific day, have really made a splash in the fundraising world. Using online portals that track donations as they come in, as well as offering challenges, match donations and real excitement for donors, giving days have been a game changer. We’ve just published a new study on how giving days can transform your fundraising. The RNL Giving Day Index looks at over $32 million in giving to answer key questions about average donations, campaign totals and donor counts, as well as the impact of volunteer ambassadors. You can download the full study at RuffaloNL.com right now to see how your giving day stacks up. I got on the line with my podcast pal Josh Robertson to unpack the results and talk about what they mean for your giving day success. As Josh explains, giving days are one of the best opportunities to get donors excited and to build a sense of urgency around giving. Outside of calendar or fiscal year end, they’re really the only other option to answer the key question “why give now.” And giving days do this simply, with the answer – because everyone else is doing it. In order to have a successful giving day, you need the right technology and a provider who knows how these complex campaigns work. With RNL Giving Days, powered by the ScaleFunder platform, we’ve integrated the best technology to make donors feel comfortable giving to YOUR institution, and make it easy. It’s important to integrate giving from all channels in your platform. We’ve also implemented key donor engagement tools like heat maps, challenges, matches, and leader boards to make it fun. Contact us today to see how RNL Giving Days can help take your special event to the next level. Crowdfunding has become very popular over the past few years. Following success in the commercial world, funding new products, artistic endeavors and other projects, we’ve seen hundreds of charities create crowdfunding campaigns and full portals with multiple campaigns to attract donors to specific needs. Higher education, with a wealth of student, faculty and athletics opportunities, has really benefited from this optimized, online and socially integrated technology. We’ve just released a comprehensive index of results from over 4,000 campaigns Ruffalo Noel Levitz charitable crowdfunding powered by the Scalefunder platform. And the results show that crowdfunding has really made a difference with our partners—over 22 million dollars actually. 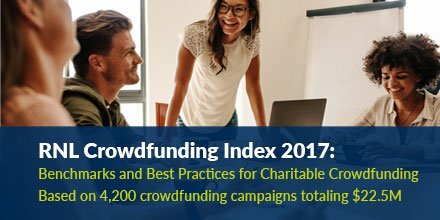 You can download the 2017 RNL crowdfunding index at RuffaloNL.com/crowdfundingsuccess. Today on the podcast, I talk with Josh Robertson about what we discovered as we looked a these great campaigns. If you are looking to attract new donors, particularly younger donors, and give your long time supporters something exciting with active feedback they can support, crowdfunding is a great tool. We’ve seen millions of dollars and hundreds of thousands of donors engaged through RNL crowdfunding. You can offer campaigns that support new initiatives, student and faculty needs, and even market your traditional annual giving program through crowdfunding. We’d love to help you get started or accelerate your existing crowdfunding program. Drop us a line and we’ll help you take your donor engagement to the next level. We’ve just released part two of our major research series Advancement Leaders Speak here at Ruffalo Noel Levitz. This time, we surveyed and spoke with 270 major and planned giving officers to find out how they do their jobs and how they feel about productivity. You can download the study at RuffaloNL.com—we included questions about average prospect pool sizes, number of visits with donors, key frustrations and challenges for gift officers, as well as what they think would make their jobs easier. I got on the line with Caryn Stein, Vice President here at RNL, to go through the results and talk a bit about what we are hearing from gift officers about their important work with donors. Productivity—it’s not always the first topic that major and planned giving programs jump on. For a profession primarily focused on personal relationships with donors, we’re not really drawn to metrics and deep data on our solicitation effectiveness. But given the increase pressure all charitable organizations are facing, and definitely for higher education, putting the right tools in place so your major and planned giving team can have success is crucial. And as Caryn and I mention, focusing on the right contact to the right donors at the right time is a key donor-centric practice that will keep your top supporters happy and increase their joy in giving. You can download the full study at RuffaloNL.com. We’d also love to hear from you about your major and planned giving program. Drop us a line, and we’ll talk about how you can improve your team’s productivity and book more gifts, immediately. Student philanthropy continues to be a hot topic in higher education. Just about every institution hosts some form of student philanthropic engagement. The goal is to engage students in causes that they are passionate about, help students thank current donors, and if we do it right, help students understand the importance of giving back as future alumni. Josh Harraman and Felicity Meu are experts with years of experience with successful student philanthropy programs. I’m proud to serve as faculty with them in the upcoming Engaging Students in Philanthropy Symposium, put together by CASE this coming August. I got Josh and Felicity on the line to talk about the state of student philanthropy, what we’re talking about this year, and what the future holds for this crucial higher education effort. Josh and Felicity offer great insights on how to engage students in philanthropy. We’re talking about a lifetime relationship with your alma mater here, and increasingly, institutions are working to start that deep philanthropic relationship before students graduate. Engaging students with the causes they care about, and inviting them to thank current donors can go a long way to making that happen. Join us at the 2017 Engaging Students in Philanthropy Symposium, August 3-5, as part of the CASE Conference for Student Advancement in Columbus. It’s the biggest event of the year for student philanthropy programs. And if you are hearing this podcast after the symposium, head over to CASE.org to find resources on accelerating your student philanthropy program, including the CASE ASAP network, the premier network for student philanthropy. Emotion—it’s a key part of fundraising, and definitely impacts the response we receive from donors. We don’t talk about emotion in fundraising enough, really. We’re usually more concerned with what segment we’re calling or mailing or what we need to tell donors. We don’t often think about how donors feel when we reach out to them. Francesco Ambrogetti has a long career as an international fundraiser, and his groundbreaking book Emotionraising: How to astonish, disturb, seduce and convince the brain to support good causes, really gets at this issue. He’s combined the best concepts in emotive response, including research in neuroscience and psychology, to provide some great examples and tips for fundraisers. I got Francesco on the line to lay out a few of the concepts and tell us what he thinks them mean for the future of fundraising. Emotionraising, and the concepts introduced by Francesco Ambrogetti in this provocative and insightful book, could just be what your fundraising campaign needs. The science of emotional response is important to your success. As fundraisers, we shouldn’t be afraid to investigate and embrace this new research and try it out on our appeals. You can find Emotionraising at Amazon. What’s keeping advancement leaders up at night? Find out what 40 higher education advancement leaders told us. Ruffalo Noel Levitz recently commissioned a major research project to better understand advancement leaders’ priorities, challenges and strategies for the future. Through in-depth interviews with leaders across the country, we uncovered what chief advancement officers are really thinking about the future. The results of 40 hour-long interviews with Chief Advancement Officers are discussed in this podcast. Jim Rogers, RNL CMO, talks about the budgeting priorities of today's higher education leaders, what leaders are judged on, and where they are shifting resources. We also talk about what this means for your fundraising strategy and what's next for the higher education fundraising industry. Getting great content in front of your donors, things that are interesting and invoke a passion for giving, is a sure fire way to build your base of support. Robert McGuire of McGuire Editorial knows this well. He’s spent years helping top non-profits and higher education institutions put together great content strategies. Increasingly, we’re hearing that the communications you provide that are outside of the ask are crucial to engaging and retaining donors. I got Robert on the line to explain what content marketing means for fundraisers, and have him provide some tips on how to accelerate your content. Marketing, communications, multichannel, omnichannel, whatever you decide to call it—it’s for sure that you’ll want be providing great content to your donors if you want to keep them engaged. In a digital world, where you can track and respond to what donors are viewing, clicking on and clicking through, you can even tailor content to specific donor interests. You’ve heard us call it a personal journey here at RNL, and content is a crucial part of that journey. You can check out some great content strategy resources from Robert at mcguireeditorial.com. Getting those messages delivered is another big part of your content strategy. At Ruffalo Noel Levitz, we have a ton of experience crafting these multichannel plans. If you’d like to accelerate your content and message delivery strategy, give us a call. We’re ready to help. And thanks for listening to the podcast. Rob Henry is one of the most passionate people I know about higher education. He cares a lot about making college available to more people and to more diverse people. He also knows that bringing new professionals into Advancement will help make that possible. As Vice President of Education for CASE, the Council for Advancement and Support of Education, he has a unique platform to help promote those goals. I’ve talked with Rob a lot about these topics when we see each other at CASE conferences every year, and I wanted to get him on the line to talk about the strategic goals of CASE, his feelings about diversity in our profession, and how we can welcome more young people as both advancement professionals and donors. Rob offers some great insights into how we can create a pipeline of energetic new professionals in the field of advancement. The work that CASE is doing will be important – we need to really broaden our view of how we bring people into our profession in order to meet our diversity goals. Developing great ways to mentor and encourage young people who want to get involved in philanthropy, because as Rob reminds us, Millennials and young people will be dominant in our donor base in years to come. RNL invests significantly in CASE because we know that sharing our experiences and successes is a key part of fundraising and donor engagement success. You can find us on the road at CASE events, conferences and even on CASE webinars. If you haven’t heard, the organization has opened up new resources and expanded their view of membership benefits this year. It’s a great time to head on over to CASE.org to check out what’s available. If you work at a higher education institution, you most likely already have membership through your Advancement division. InsidePhilanthropy.com is an incredible place to find out about who’s funding what and why. That’s the mission that David Callahan, Founder and Editor has set out to accomplish. You can get fresh insights, about big funders as well as every day donors, daily on the site. David’s a font of knowledge about philanthropic trends, and I wanted to get him on the line to offer his insights on 2017 fundraising, and make some predictions about the philanthropic space. David has just published a great book called The Givers. It’s an inside look at the world of our top charitable givers - mega philanthropists. You find the book on Amazon or your local book store. David makes great points about the explosion of charities, and how funders can even tell them apart. We’re all facing this important need to distinguish our causes. And with donors expecting more transparency and results, we all need greater stewardship and data on the impact of giving. Head over to insidephilanthropy.com to catch more daily coverage of philanthropy trends and fundraiser insights. Getting in front of your donors to talk about your institution’s impact and the impact of their gifts is important. At Ruffalo Noel Levitz, we have an advanced suite of solutions to help you do just that. Whether it’s reaching out via digital channels, direct mail or the phone, we can help you put together a rock star strategy that gets your message notices. Head over to RuffaloNL.com to find out more today. What if the NCAA brackets were decided based on alumni giving statistics? So, we created our March (Alumni Giving) madness tournament to answer that fun question. It’s a fun way to look at how institutions compare in alumni giving participation percentages, donor counts, total dollars from alumni, and even online giving strategy. On today’s podcast, we break down the 2017 results that lead to victories for Penn and Northwestern. You can see all the results, with commentary, round by round at ruffalonl.com/givingmadness. I got Josh Robertson, Vice President here at RNL on the line to go through this year’s methodology and results. Over 10 billion dollars – That’s what higher education alumni gave in 2016. That’s a huge portion of the philanthropy that makes a difference for students, faculty and all the great life-changing experiences that colleges and universities provide. It turns out that if you base the tournament on giving, not basketball, the winners end up a bit different. If you’d like to see how you compare to peers on some of these statistics, drop us a line. You can head to ruffalonl.com/givingmadness to request a customized donor comparison report. And we’ll talk about how you can recruit your best possible alumni giving team for next year’s tournament. If you’re an annual giving professional—particularly in higher education, you’ve probably heard about Annual Giving Network. Dan Allenby, founder of the network has done a great job addressing whatever is hot in annual giving strategy today while focusing on the fundamentals. With great content, webinars, a job posting network, and great member interaction, annualgiving.com has become a destination for those of us who want to stay educated about the best ways to engage donors. In fact, Dan comes off like he was born into annual giving. And based on what he told me, that’s not too far from the truth. I wanted to get Dan on the line to talk about AGN’s strategy and what he’s trying to accomplish with the network. Dan offers a lot of great insights for how we can do the best job possible engaging, asking, and thanking our annual giving donors. Like he said, we restart every year in annual giving—but the fundamentals of a donor engagement strategy never go away. Are you ready to take your annual giving to the next level? Ruffalo Noel Levitz has great resources, and a great team of experts ready to help you accelerate your annual giving strategy. Head over to ruffaonl.com to find out about our phone, multichannel and digital solutions which are designed to engage 21st century donors at your maximum return on investment. Tim Sandoval, reporter for the Chronicle of philanthropy, has his finger on the pulse of where people are giving, and how fundraisers are marketing to their supporters. He regularly covers big trends, like tax policy and regulation, but also jumps headlong into tactics being used by the best organizations. You read articles from him almost daily in the Chronicle. I’ve had a few chances to talk with Tim in the past about philanthropy news and trends, and I wanted to get him on the line to talk about what he’s seeing in the first part of 2017, and were we might be going next. Tim makes great points about reaching out to donors during a time of change. The Chronicle of Philanthropy is a great source for news, tactics and advice on how to shape your fundraising program. You can head over to philanthropy.com to see their coverage, as well as special reports and fundraiser tool kits. Monitoring the broad trends in philanthropy and public policy are important to deciding what to do next with both your annual and major donors. You just can’t book big gifts if your fundraising team isn’t productive. This is a top concern for fundraisers who are being asked to book bigger and bigger giving totals each year. Ruffalo Noel Levitz talked to hundreds of major and planned giving fundraisers in 2016 and heard some common roadblocks that are hold teams back: finding the right donors to talk to, supporting gift officers with good information and training, and preparing donors and fundraisers for great visits. Add in gift officer turnover, and many organizations are struggling to reach their fundraising potential. So we embarked on the creation of a solution that’s great for both donors and fundraisers. This podcast features 7 RNL leaders providing a look “under the hood” to show how the solution came together. They discuss what increasing productivity can mean for your aspirational fundraising goals. How warming up donors before a conversation makes a difference. Getting help with a first conversation to qualify donors and schedule a gift officer meeting. Why productivity matters for your overall goals. And read more about our take on major and planned giving productivity at blogfm.ruffalonl.com. Online giving is growing rapidly. We’ve all seen our online donation activity rise, and this is a big transition for many fundraising programs, as online giving grows at up to three times the rate of over all giving. Mike Kim at iATS payments knows a lot about this. As one of the largest payment processing providers for non-profits, the company has seen a lot of growth in online giving, and is following the trends closely. I got Mike on the line to talk about payment integration, building trust and security with donors, how to optimize the online giving experience, and what’s next for online giving. How you're doing more than collecting gifts with your online giving. Keys to building relationships and trust with your online portal. Taking donors from interest to transaction completion. Telling a compelling to story--highly personalized, evoking emotion, encouraging action right now--is a big part of fundraising success in the 21st century. Caryn Stein, Vice President here at RNL knows this. She’s spent her career doing just that to help hundreds of charities. I got Caryn on the line to talk about the power of digital engagement, storytelling, and what she thinks is next for the future of fundraising. She calls it storytelling "surround sound" and explains how engaging donors in a personalized, powerful way through technology can really amplify your results. If you want to find out how RNL uses these tactics to take your program to the next level, drop us a line.